"SLIPPING OUT OF ENEMY CAMP"
"Father Sky came up pearly, the color of the linings of mollusk shells, that early dawn when Star Lily decided to make her move. Stepping softly, she left the tipi, as was her habit, prepared to hunt for plants and herbs and bits of nature that held power. Gazing around at the sleeping enemy camp, seen only dimly through thick fog, she suddenly knew that there would never be a better time to make her escape. Although her life had been spared after she succeeded in healing the chief's son of a fever, living as a hostage among hostile strangers was more difficult than she could have ever imagined. Miraculously, she was untouched, having had the wits to communicate from the very first that if she were mistreated in any way, then her healing powers would vanish. Star Lily's captors had believed her, especially after the chief's only son survived his illness, one that the official Medicine Man had been unable to cure. After that, the strong, mostly silent young healer was tasked with setting broken bones, delivering babies, praying over the dying and stitching up wounds. Her wrists were unbound whenever she was called to use her medicinal skills, then tied again every night when she retired to the chief's lodge. At first, Star Lily had assumed that having her hands tied would prevent her from ever escaping. The enemy tribe seemed to think so, too, in part because the wily healer began acting the role assigned to her: that of a helpless captive who was grateful simply to survive, kept alive only for her gifts. Like an aphid being stroked by an ant, valued as a honey cow of one sort, or another. Over the months of captivity, Star Lily had kept her eyes cast down, shuffled uncertainly, flinched at any sudden movement or loud voices, and appeared to be lacking in both intelligence and initiative. Given the opportunity, though, she befriended a spotted pony and won its heart. She also practiced, whenever possible, leaping up and hurling herself across the pony's barrel body, and then sitting up and riding for short distances. Mother Earth had whispered just last evening, as twilight fell, to stay alert because the opportunity to get away was coming soon. Everyone was bedded down and already drowsing when she heard the chief's wife ask him about his next raid? Unbelievably, the man spoke the name of her people, adding that they were only two days ride toward the west. He and his warriors would leave on the second rising sun. Heavy fog had rolled in during the night, muffling sounds and limiting visibility to less than a few paces. 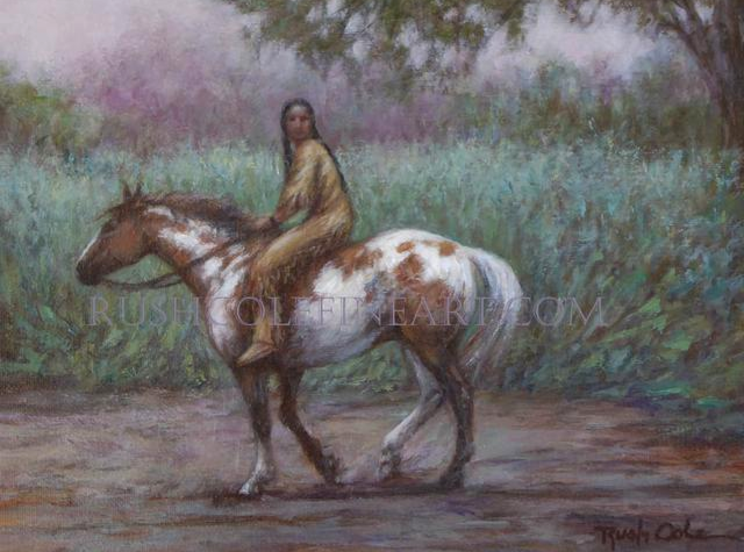 Star Lily departed the tipi without disturbing any of the others and walked softly toward the trees down by the river, the rawhide strips tight around her wrists. Her pony was waiting for her. Star Lily cupped her hands around the soft muzzle, a signal for silence and the horse nodded. The slim young woman pulled a length of twisted leather from a hiding place behind one of the trees, threaded it into the pony's mouth, knotted it beneath the jaw, and draped the long reins across the furry withers. Then, with a single fluid leap, she was up and across the spine. A few more practiced moves, and Star Lily was astride, upright, and gripping the reins between her hands. Not a sound came from the camp. On sudden impulse, the captive healer thrust the reins between her teeth as she leaned down and untied the high line holding the rest of the tribe's horses in place. The lead mare obediently ambled off in the opposite direction from which Lily was set on traveling, and the rest of the herd followed. Tracking with them as they crossed the river and forded onto the opposite bank, Star Lily lay low on her pony's neck until she and the herd were out of sight of the village. The sky was only slightly brighter in one direction, but it was enough to know that her path lay away from the sun rising behind the fog. Squeezing her knees against the pony's warm sides, Star Lily recrossed the river and headed in the direction of the ones who were like her. Somewhere up the trail, when it felt far enough away to be safe, she would dismount and find a jagged rock on which to rub the leather bindings on her wrists until they fell away. Star Lily was returning home under her own power, and in total freedom."